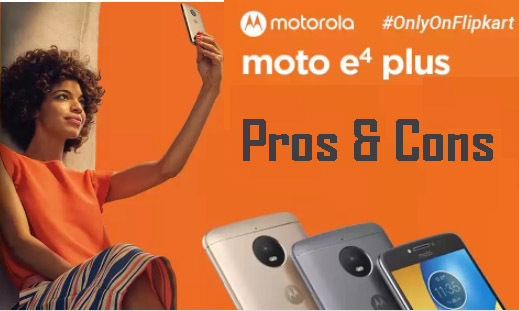 Moto E4 Plus is the smartphone launched by Motorola at the price range 10k. The device is exclusively available through Flipkart for Rs.9999. E4 plus is having very good specifications for this price. Moto E4 Plus has a lot of advantages and is very much worth for the price of Rs.9999. The devices come with a lot of attractive features and specifications. Moto E4 Plus has a lot of advantages like it comes with a massive battery which can run device up to 2 days. The battery is of 5000mAh. The device has a fingerprint sensor for supporting fingerprint locks. It is powered by 3 GB RAM. Which enables heavy multitasking. The storage of E4 plus is 32 GB and expandable upto 256 GB. This is a good storage capacity for this price. The sound system of this phone is excellent. The sound system is Dolby Atmos. Advantages of the camera are that it has front and rear flash. The front camera is 5 Mega Pixel and rear camera is 13 MegaPixel. One of the major disadvantages of Moto E4 Plus is the processor. The processor is only quad core and is of Mediatek. The processor is 1.3 GHz quad core Mediatek. This is the only disadvantage. Rest of the features are very good. And the device is very worthy for the price. Moto E4 Plus is very worthy for the price. The device has best specifications. All specs are very satisfying. The processor disadvantage may be a problem only for the heavy smartphone users.